Al-Nusra Front or Jabhat al-Nusra (Arabic: جبهة النصرة‎), known as Jabhat Fatah al-Sham (Arabic: جبهة فتح الشام‎) after July 2016, and also described as al-Qaeda in Syria or al-Qaeda in the Levant, was a Salafist jihadist organization fighting against Syrian government forces in the Syrian Civil War. Its aim was to establish an Islamic state in the country. Formed in 2012, in November of that year The Washington Post described al-Nusra as "the most aggressive and successful" of the rebel forces. In December 2012, the United States Department of State designated it a foreign terrorist organization, and in November 2013, it became the official Syrian branch of al-Qaeda. In March 2015, the group joined with other jihadist groups to form the Army of Conquest. In July 2016, al-Nusra formally re-branded as Jabhat Fatah al-Sham ("Front for the Conquest of the Levant"). On 28 January 2017, following violent clashes with Ahrar al-Sham and other rebel groups, Jabhat Fatah al-Sham merged with four other groups to become Hayat Tahrir al-Sham. From 2012 to 2013, the al-Nusra Front's full name was the "Victory Front for the People of the Levant by the Mujahideen of the Levant on the Fields of Jihad" (Arabic: جبهة النصرة لأهل الشام من مجاهدي الشام في ساحات الجهاد‎, transliteration: Jabhat an-Nuṣrah li-ahli ash-Shām min Mujahideen ash-Shām fi Sahat al-Jihad). The al-Nusra Front was primarily made up of Syrian jihadists. Its goals were to overthrow Bashar al-Assad's government in Syria and to create an Islamic emirate under sharia law, with an emphasis from an early stage on focusing on the "near enemy" of the Syrian regime rather than on global jihad. Syrian members of the group claimed that they are fighting only the Assad regime and would not attack Western states; while the official policy of the group was to regard the United States and Israel as enemies of Islam, and to warn against Western intervention in Syria, al-Nusra Front leader Julani stated that "We are only here to accomplish one mission, to fight the regime and its agents on the ground, including Hezbollah and others". In early 2014, Sami al-Oraydi, a top sharia official in the group, acknowledged that it is influenced by the teachings of al-Qaeda member Abu Musab al-Suri. The strategies derived from Abu Musab's guidelines included providing services to people, avoiding being seen as extremists, maintaining strong relationships with local communities and other fighting groups, and putting the focus on fighting the government. The tactics of al-Nusra Front differed markedly from those of rival jihadist group ISIL; whereas ISIL has alienated local populations by demanding their allegiance and carrying out beheadings, al-Nusra Front cooperated with other militant groups and declined to impose sharia law where there has been opposition. Analysts have noted this could have given the al-Nusra Front a greater long-term advantage. Both al-Qaeda and al-Nusra tried to take advantage of ISIL's rise by presenting themselves as "moderate" in comparison. While they had the same aim of establishing sharia and a caliphate, they intended to implement it in a more gradual manner. Al-Nusra criticized the way ISIL alienated people by precipitously instituting sharia, preferring the more gradual approach favored by al-Qaeda of preparing society through indoctrination and education before implementing the hudud aspects of sharia. They particularly criticised ISIL's enthusiasm for punishments such as executing gay people, chopping limbs off, and public stoning. However, Al-Qaeda agrees that hudud punishments should be implemented in the long term. The main criticism of defectors from ISIL is that the group is killing and fighting other Sunni Muslims, and that they are unhappy that other Sunnis like Jabhat al-Nusra are being attacked by ISIL. A video called The Heirs of Glory was issued by al-Nusra in 2015, which included old audio by Osama bin Laden (such as his 1998 announcement that "So we seek to incite the Islamic Nation so it may rise to liberate its lands and perform Jihad in the path of Allah, and to establish the law of Allah, so the Word of Allah may be supreme"). The video glorified the September 11 attacks and the Islamists Sayyid Qutb and Abdullah Azzam. Its magazine, Al Risalah, was first issued in July 2015. In 2015 Al-Qaeda leader al-Zawahiri urged ISIL fighters to unite with all other jihadists against their enemies and stop the infighting. The Nusra Front praised the November 2015 Paris attacks, saying that even though they view ISIL as "dogs of hellfire", they applaud when "infidels" get attacked by ISIL. In an Amnesty International report in July 2016, the al-Nusra Front was accused of torture, child abduction, and summary execution. In December 2014, al-Nusra Front fighters shot dead a woman execution-style on accusations of adultery. They have also stoned to death women accused of extramarital relations. Overall, they have "applied a strict interpretation of Shari'a and imposed punishments amounting to torture or other ill-treatment for perceived infractions." Members of the group were accused of attacking the religious beliefs of non-Sunnis in Syria, including the Alawis. New York Times journalist C. J. Chivers cites "some analysts and diplomats" as noting that al-Nusra Front and the Islamic State of Iraq and the Levant "can appear less focused on toppling" the Assad government than on "establishing a zone of influence spanning Iraq's Anbar Province and the desert eastern areas of Syria, and eventually establishing an Islamic territory under their administration". On 10 June 2015, al-Nusra fighters shot dead at least 20 Druze civilians in a village after one of them, a supporter of the Assad regime, opposed the expropriation of his house by a Nusra commander. Al-Nusra's leadership issued an apology and claimed that the killings had been carried out against the group's guidelines. Foreign Affairs magazine, which contends that Al-Jazeera is engaged in actively whitewashing Al-Nusra, said that there is absolutely no reference to the Druze in Al-Nusra's "apology", since Al-Nusrah forced the Druze to renounce their religion, destroyed their shrines and now considers them Sunni. Nusra and ISIL are both against the Druze, the difference being that Nusra was apparently satisfied with destroying Druze shrines and making them become Sunnis while ISIL wants to violently annihilate them as it does to Yazidis. The leader of al-Nusra, a self-proclaimed emir, goes by the name of Abu Mohammad al-Julani (also transliterated as Mohammed and al-Jawlani, or al-Golani), which implies that he is from the Golan Heights (al-Jawlan, in Arabic). Prior to the formation of Jabhat al-Nusra, Abu Mohammad al-Julani was a senior member of Islamic State of Iraq, heading operations in Nineveh Governorate. On 18 December 2013, he gave his first television interview, to Tayseer Allouni, a journalist originally from Syria, for Al Jazeera, and spoke classical Arabic with a Syrian accent. Deputy leader and senior religious official in al-Nusra Left the group after the formation of Tahrir al-Sham. The structure of the group varied across Syria. In Damascus, the organisation operated in an underground clandestine cell system, while in Aleppo, the group was organised along semi-conventional military lines, with units divided into brigades, regiments, and platoons. All potential recruits were required to undertake a ten-day religious training course, followed by a 15–20-day military training program. Al-Nusra contained a hierarchy of religious bodies, with a small Majlis-ash-Shura (Consultative Council) at the top, making national decisions on behalf of the group. Religious personnel also played an important role in the regional JN leadership, with each region having a commander and a sheikh. The sheikh supervised the commander from a religious perspective and is known as dabet al-shar'i (religious commissioner). A number of Americans have attempted to join the fighting in Syria, specifically with al-Nusra. Sinh Vinh Ngo Nguyen, also known as Hasan Abu Omar Ghannoum, was arrested in California on 11 October 2013, on charges of attempting to travel to join al-Qaeda, after reportedly having fought in Syria. As of November 2013, there had also been five additional publicly disclosed cases of Americans fighting in Syria, three of which were linked to al-Nusra. In February 2015, charges of conspiracy to support terrorism were laid against six Bosnian-Americans who were alleged to have financially supported another Bosnian-American, the late Abdullah Ramo Pazara, who they alleged died fighting with al-Nusra in 2014. It was estimated that al-Nusra's fighting force was approximately 30% foreign fighters and 70% local Islamists. Nusra absorbed Katibat at-Tawhid wal-Jihad, an Uzbek group. Katibat Imam al Bukhari is a part of al-Qaeda. Child soldiers were used by Katibat Imam al-Bukhari. al-Fu'ah and Kafriya were attacked by the group. They also participated in the 2015 Jisr al-Shughur offensive. All statements and videos by al-Nusra Front have been released by its media outlet, al-Manarah al-Bayda (The White Minaret), via the leading jihadist webforum Shamoukh al-Islam. In early 2015, there were reports that Qatar and other Gulf states were trying to get al-Nusra to split away from al-Qaeda, after which they would support al-Nusra with money. Western observers and a Syrian observer considered such a split unlikely, and in March 2015, al-Nusra's leadership denied a break-up or that talks with Qatar had occurred. Other Syrian observers considered such a split conceivable or imminent. In December 2015, al-Nusra's emir Abu Mohammad al-Julani refused to dissociate from al-Qaeda's ideology and stated that even if the group leaves al-Qaeda, they would continue to enforce Sharia and wage jihad against their enemies. With members of al-Qaeda still enmeshed throughout the group's leadership, it can be considered that al-Qaeda was not "external" to the group. After the announcement, numerous senior al-Qaeda members still within the group were targeted by the US in airstrikes. The group's leader Abu Mohammad al-Julani, in his first recorded video message, stated its new name would be Jabhat Fatah al-Sham ("Front for the Conquest of the Levant"). During the renaming announcement in July 2016, al-Julani thanked al-Qaeda leaders Ayman al-Zawahiri and Abu Khayr al-Masri. Ahmad Salama Mabruk, an associate of al-Zawahiri, sat alongside al-Julani during the announcement. Despite the group re-branding and announcing no external affiliations, the United States Central Command continued to consider it to be a branch of al-Qaeda and "an organization to be concerned about". Al-Jazeera journalist Sharif Nashashibi noted that immediately after the rebranding, both the US and Russia called it "cosmetic" and promised that air strikes would continue" against al-Nusra. Journalist Robin Wright described the rebranding as an "jihadi shell game" and "expedient fiction"—a tactic known as "marbling" by jihadi groups—and that as of December 2016 Al-Qaeda had embedded "two dozen senior personnel" in the group. Writing shortly after the rebranding, Nashashibi argued that it might help generate more "regional support", which the group needed in the face of Syrian government and Russian military success. Wright wrote that the move was effective with many conservative Sunnis in the region, and that hundreds of them joined its ranks since the rebranding, believing the group to be "less extreme" than the rival Islamic State. Khorasan, also known as the Khorasan Group, is an alleged group of senior al-Qaeda members who operate in Syria. The group has been reported to consist of a small number of fighters who are all on terrorist watchlists, and to co-ordinate with al-Nusra Front. Al-Nusra Front leader Abu Mohammad al-Golani denied the existence of this alleged "Khorasan group" in an interview with Al-Jazeera on 28 May 2015. Upon the outbreak of the Syrian Civil War in 2011, Islamic State of Iraq's leader Abu Bakr al-Baghdadi and al-Qaeda's central command authorized the Syrian Abu Mohammad al-Golani to set up a Syrian offshoot of al Qaeda in August 2011, to bring down the Assad government and establish an Islamic state there. Golani and six colleagues crossed the border from Iraq into Syria, and reached out to Islamists released from Syria's Sednaya military prison in May–June 2011 who were already active in fighting against Assad's security forces. The six men who founded Nusra alongside Julani were Saleh al-Hamawi (Syrian), Abu Maria Al-Qahtani (Iraqi), Mustafa Abd al-Latif al-Saleh (kunya:Abu Anas al-Sahaba) (Jordanian/Palestinian), Iyad Tubasi (kunya: Abu Julaybib) (Jordanian/Palestinian), Abu Omar al-Filistini (Palestinian) and Anas Hassan Khattab (Syria). A number of meetings were held between October 2011 and January 2012 in Rif Dimashq and Homs, where the objectives of the group were determined. Golani's group formally announced itself under the name "Jabhat al-Nusra l'Ahl as-Sham" (Support Front for the People of the Sham) on 23 January 2012. Iraq's deputy interior minister said in early February 2012 that weapons and Islamist militants were entering Syria from Iraq. The Quilliam Foundation reported that many of Nusra's members were Syrians who were part of Abu Musab al-Zarqawi's Islamist network fighting the 2003 American invasion in Iraq; Iraqi Foreign Minister Hoshyar Zebari agreed to that in 2012. The British The Daily Telegraph stated in December 2012 that many foreign al-Nusra fighters were hardened veterans from conflicts in Iraq and Afghanistan. By the second half of 2012, Jabhat al-Nusra stood out among the array of armed groups emerging in Syria as a disciplined and effective fighting force. Nusra in October 2012 refused a call for a four-day ceasefire in Syria during Eid al-Adha feast. In November 2012, they were considered by The Huffington Post to be the best trained and most experienced fighters among the Syrian rebels. According to spokesmen of a moderate wing of the Free Syrian Army (FSA), Nusra had in November 2012 between 6,000 and 10,000 fighters, accounting for 7–9% of the FSA's total fighters. Commentator David Ignatius for The Washington Post described Nusra then as the most aggressive and successful arm of the FSA. The United States Department of State stated likewise: "From the reports we get from the doctors, most of the injured and dead FSA are Jabhat al-Nusra, due to their courage and [the fact they are] always at the front line". On 10 December 2012, the U.S. designated Nusra a foreign terrorist organization and an alias of Al Qaeda in Iraq. That decision made it illegal for Americans to deal financially with Nusra. Days earlier, the American ambassador to Syria, R. Ford, had said: "Extremist groups like Jabhat al-Nusra are a problem, an obstacle to finding the political solution that Syria's going to need". Al-Nusra Front fighters during the Syrian Civil War. In August 2012, there were signs of Nusra co-operating with other rebels. The group took part in military operations with the Free Syrian Army (FSA). Abu Haidar, a Syrian FSA co-ordinator in Aleppo's Saif al-Dawla district said that al-Nusra Front "have experienced fighters who are like the revolution's elite commando troops." In October–December 2012 Nusra received words of praise and appreciation for their efforts in the "revolution" against Assad from non-specified 'rebels', an FSA spokesman in the Aleppo region, a group of 29 civilian and military groups, and the leader of the Syrian National Coalition. At the same time, two anonymous FSA leaders, and a secular rebel in north Syria, expressed disapproval of the Islamist 'religious prison' Nusra might be wanting to turn Syria into. The 6 January 2012 al-Midan bombing was claimed by al-Nusra, in a video seen by AFP on 29 February 2012. It was allegedly carried out by Abu al-Baraa al-Shami. Footage of the destruction caused by the blast was released on a jihadist forum. The video asserts that the "martyrdom-seeking operation" was executed "in revenge for our mother Umm Abdullah—from the city of Homs—against whom the criminals of the regime violated her dignity and threatened to slaughter her son," SITE reported. The video shows "an excerpt of allegiances, operations, and training of the al-Nusra Front" as well as a fighter "amongst the masses in a public demonstration, advising them to do their prayers and adhere to the rituals of Islam." An al-Nusra-affiliated group announced the formation of the "Free Ones of the Levant Battalions", in a YouTube video statement that was released on 23 January 2012. In the statement, the group claimed that it attacked the headquarters of security in Idlib province. "To all the free people of Syria, we announce the formation of the Free Ones of the Levant Battalions," the statement said, according to a translation obtained by The Long War Journal. "We promise Allah, and then we promise you, that we will be a firm shield and a striking hand to repel the attacks of this criminal Al Assad army with all the might we can muster. We promise to protect the lives of civilians and their possessions from security and the Shabiha [pro-government] militia. We are a people who will either gain victory or die." The March 2012 Damascus bombings were claimed by Nusra. The 10 May 2012 Damascus bombings were allegedly claimed by al-Nusra Front in an Internet video; however, on 15 May 2012, someone claiming to be a spokesman for the group denied that the organisation was responsible for the attack, saying that it would only release information through jihadist forums. On 29 May 2012, a mass execution was discovered near the eastern city of Deir ez-Zor. The unidentified corpses of 13 men had been discovered shot to death execution-style. On 5 June 2012, al-Nusra Front claimed responsibility for the killings, stating that they had captured and interrogated the soldiers in Deir ez-Zor and "justly" punished them with death, after they confessed to crimes. On 17 June 2012, Walid Ahmad al-Ayesh, described by Syrian authorities as the "right hand" of al-Nusra Front, was killed when Syrian authorities discovered his hiding place. He was reportedly responsible for the making of car bombs that were used to attack Damascus in the previous months. The Syrian authorities reported the killing of another prominent member of the group, Wael Mohammad al-Majdalawi, killed on 12 August 2012 in an operation conducted in Damascus. On 27 June 2012, a group of Syrian rebels attacked a pro-government TV station in the town of Drousha, just south of the capital Damascus. The station's studios were destroyed with explosives. Seven people were killed in the attack on Al-Ikhbariya TV, including four guards and three journalists. Al-Nusra claimed responsibility for the attack and published photos of 11 station employees they kidnapped following the raid. The murder in July 2012 of journalist Mohammed al-Saeed, a well-known government TV news presenter, was claimed by Nusra in a video released on 3 or 4 August, according to Syrian Observatory for Human Rights. The 3 October 2012 Aleppo bombings were claimed by Al-Nusra. Three suicide car bombs exploded at the eastern corner of the central Saadallah Al-Jabiri Square killing 48 people. More than 122 people were reported to be heavily injured. The bombs targeted the Officers' club and the nearby buildings of the Touristic Hotel and the historic "Jouha Café". The hotel received major damage while the café was entirely destroyed. A small building within the Officers' club was ruined as well. In the air defence base assault they reportedly destroyed buildings and sabotaged radar and rockets after over-running the base in co-operation with the al-Fajr Islamic Movement and a group of Chechen fighters. During the storming of the Hanano barracks 11 soldiers were killed and they held the complex for six hours before retreating. They also claimed killing 32 soldiers during the raid on the Raqqah base. In October 2012, they joined other rebels in an attack on the Wadi Deif base around Maraat al Numan, in a prolonged fighting that turned into a siege of the base. They also led an attack on the Taftanaz Air Base in November 2012, an important and strategic base for the Syrian army, containing up to 48 helicopters. The group seized three army checkpoints around Saraqeb at the end of October 2012, forcing the Syrian Army to withdraw from the area the next day. In the battle, 28 Syrian soldiers were killed as well as five Nusra fighters. Some of the captured soldiers were summarily executed after being called "Assad dogs". The video of these executions was widely condemned, with the United Nations referring to them as probable war crimes. Members of al-Nusra Front carried out two suicide attacks in early November 2012. One occurred in a rural development center in Sahl al-Ghab in Hama province, where a car bomb killed two people; while the other occurred in the Mezzeh neighbourhood of Damascus, where a suicide bomber killed 11 people. The SOHR claimed a total of 50 soldiers were killed in the Sahl al-Ghab attack. Al Jazeera reported on 23 December 2012 that al-Nusra Front had declared a "no-fly-zone" over Aleppo, using 23 mm and 57 mm anti-aircraft guns to down planes. This would include commercial flights which al-Nusra believed transported military equipment and troops. In a video sent to Al Jazeera, they warned civilians against boarding commercial flights. In February 2013, Al Nusra fighters were involved in fighting in Safira with government reinforcements, preventing these forces from reaching their destination of the city of Aleppo. A monitoring group claims this resulted in more than two hundred casualties over a period of two weeks. Though it was initially reported that Syrian Catholic priest François Murad was beheaded by Nusra at a church in Gassanieh in June 2013, he was actually shot dead. As of June 2013, al-Nusra Front had claimed responsibility for 57 of the 70 suicide attacks in Syria during the conflict. In December 2013, al-Nusra abducted 13 nuns from a Christian monastery in Maaloula. They were held in the town of Yabroud until 9 March 2014, The nuns reported they had not been harassed and could keep religious symbols. By January 2013, Nusra was a formidable force alleged to have strong popular support in Syria, and it continued to grow in strength during the following months. In January 2013, the Quilliam counter-extremism thinktank estimated its membership at 5,000 fighters with 2,000 trainees. By July 2013, The Economist estimated its strength at 7,000 fighters. 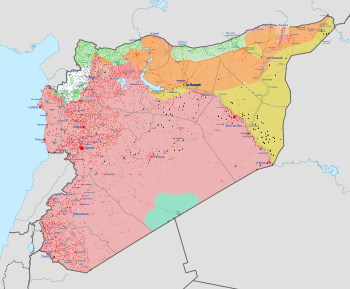 Other size estimates, however, were more conservative; a report in the Turkish daily Hurriyet in March 2013 said that the group had increased its membership from around 300-400 jihadists to 1,000 as Syrian fighters in Iraq have returned to their country in the wake of the US designation of al-Nusra as a terrorist organisation. On 8 April 2013, the leader of the then Islamic State of Iraq (ISI), Abu Bakr al-Baghdadi, released a recorded audio message on the Internet, in which he announced that Jabhat al-Nusra was part of his network, and that he was merging Jabhat al-Nusra with ISI into one group, "Islamic State of Iraq and al-Sham" (ISIL), under his command. Al-Baghdadi also said that Abu Mohammad al-Julani had been dispatched by the ISI to Syria to meet with pre-existing cells in the country and that the ISI had provided Jabhat al-Nusra with the plans and strategy needed for the Syrian Civil War, and had been funding their activities. The next day al-Julani rejected the merger and affirmed the group's allegiance to al-Qaeda and its leader, Ayman al-Zawahiri. Al-Julani was quoted as saying, "We inform you that neither the al-Nusra command nor its consultative council, nor its general manager were aware of this announcement. It reached them via the media and if the speech is authentic, we were not consulted." Nusra then split, with some members, particularly foreign fighters, following Baghdadi's edict and joining ISIL, while others stayed loyal to Golani or left to join other Islamist brigades. In May 2013, Reuters reported that al-Baghdadi had travelled from Iraq to Syria's Aleppo Governorate province and begun recruiting members of al-Nusra. Sometime in May 2013, al-Julani was reportedly injured by an airstrike conducted by the Syrian government. In June 2013, Al Jazeera reported that it had obtained a letter written by al-Qaeda leader Ayman al-Zawahiri, addressed to both Abu Bakr al-Baghdadi and Abu Mohammad al-Julani, in which he ruled against the merger of the two organisations and appointed an emissary to oversee relations between them and put an end to tensions. Later in the month, an audio message from al-Baghdadi was released in which he rejected al-Zawahiri's ruling and declared that the merger of the two organisations into the Islamic State of Iraq and the Levant was going ahead. This sequence of events caused much confusion and division amongst members of al-Nusra. In November 2013, Al-Zawahiri ordered the disbandment of ISIL and said al-Nusra should be considered the (only) al-Qaeda branch in Syria, and bestowed the title "Tanzim Qa'edat Al-Jihad fi Bilad Al-Sham" ("the Qae'dat Al-Jihad organization in the Levant") on them, officially integrating Nusra into al-Qaeda's global network. Some units of al-Nusra began taking part in clashes against the Islamic State of Iraq and the Levant in late 2013. In February 2014, after efforts to end the dispute between ISIL and Nusra had failed, al-Qaeda formally dissociated itself from its onetime affiliate ISIL, leaving Jabhat al-Nusra the sole representative of al-Qaeda in Syria. In the same month, al-Julani threatened to go to war with ISIL over their suspected role in the killing of senior Ahrar ash-Sham commander Abu Khaled al-Souri. Al-Julani gave ISIL five days to submit evidence that they were innocent of the attack to three imprisoned Jihadist clerics, Abu Muhammad al-Maqdisi, Abu Qatada al-Falastini, and Suleiman al-Alwan. On 16 April 2014, ISIL killed al-Nusra's Idlib chief Abu Mohammad al-Ansari together with his family, the Syrian Observatory for Human Rights reported. In May 2014, open fighting broke out between ISIL and al-Nusra in Deir ez-Zor Governorate, leaving hundreds dead on both sides. By July 2014, al-Nusra had largely been expelled from Deir ez-Zor Governorate. Also in July, an audio recording attributed to al-Julani appeared online, in which he said that al-Nusra planned to establish an Islamic emirate in the areas of Syria where they had a presence. A statement issued on 12 July 2014 by al-Nusra's media channel affirmed the authenticity of the recording, but stated that they had not yet declared the establishment of an emirate. In June 2015, al-Julani stated in regards to ISIL: "There is no solution between us and them in the meantime, or in the foreseeable future [...] We hope they repent to God and return to their senses ... if not, then there is nothing but fighting between us." On 28 August 2014, militants from the group kidnapped 45 UN peacekeepers from Fiji from Golan Heights in the United Nations Disengagement Observer Force Zone. The group demanded that it be removed from the UN's list of terrorist organisations in exchange for the lives of the peacekeepers. In addition to UN personnel, the group routinely captures UN vehicles to use as car bombs. At the same time, two groups of UN peacekeepers from Philippines were trapped under fire in nearby Rwihinah. On 31 August, one group of 32 Filipinos soldiers was rescued and the other group of 40 soldiers escaped. The rescue operation was carried out by Irish peacekeepers. Colonel Ezra Enriquez of the Philippines, who oversaw the operations, resigned over disagreements with Indian Lieutenant General Iqbal Singh Singha. Singha had allegedly ordered the Filipinos peacekeepers to surrender arms to ensure the safe release of the Fijian soldiers. On 8 September, Rodrigo Duterte, the mayor of Davao City, called for Singha's death after he allegedly called the Filipinos soldiers cowards. On 11 September, the kidnapped Fijian soldiers were released. In late October 2014, al-Nusra began attacking some FSA and moderate Islamist groups that it was formerly allied with, reportedly in a bid to eventually establish its own Islamic state in the cities it controlled in Idlib Governorate and other neighbouring Governorates. In June 2015, fighters of al-Nusra massacred 20 Druze villagers in Idlib province located in north-west Syria. Al-Jazeera claimed that Al-Nusra's leadership apologized and blamed the incident on a few undisciplined fighters. In October 2015, al-Nusra offered bounties worth millions of dollars for the killing of Syrian President Bashar al-Assad and Hezbollah leader Sayyed Hassan Nasrallah. Al-Julani said he would pay "three million euros ($3.4 million) for anyone who can kill Bashar al-Assad and end his story". In December 2015, two Army of Revolutionaries fighters were beheaded by Nusra, according to sources on social media. In December 2015, Nusra fighters celebrated the ransoming and exchange of Lebanese army prisoners in the town of Arsal in Lebanon, according to sources on social media. In 2015, rebel factions in southern Syria vowed to distance themselves from the 'extremists' of al-Nusra in April 2015, but were seen cooperating with them in Daraa only days later. During successful Syrian opposition offensives in the northern Idlib Governorate from March until May 2015 (see also March–April offensive and April–June 2015 offensive), al-Nusra effectively coordinated its operations with Free Syrian Army, moderate and conservative Syrian Islamists, and some independent jihadist factions. On 24 January 2016, Ahrar ash-Sham expelled al-Nusra Front from the Syrian town of Harem, after tensions between the two groups boiled over. Subsequent clashes erupted in Salqin. On 17 February 2016, nearly half of Jund al-Aqsa, numbering 400 fighters, joined al-Nusra. Five days later, two Damascus-based jihadist groups swore allegiance to al-Nusra. On 25 February, al-Nusra Front withdrew from the town of Sarmada, near the Turkish border in the Idlib Province, in an attempt to prevent Russian warplanes from bombing the town after the implementation of the Syria ceasefire. Russia sees al-Nusra as a terrorist organization. Russian air strikes reportedly targeted positions held by al-Nusra from September 2015 and Al-Nusra set a reward for the seizure of Russian soldiers. In October 2015 Al-Nusra militant Abu Ubaid Al-Madani, who speaks Russian, released a video addressed to the Russians warning that they would massacre Russian soldiers. Abu Mohammad al-Julani called for Russian civilians to be attacked by former Soviet Muslims and called for attacks on Alawite villages in Syria. In November 2015, al-Nusra fighters and Turkish-supported Syrian Turkmen Brigades were engaged in heavy fighting in Syria's northwestern Latakia Governorate against the Syrian government forces supported by the Shiite militias and the Russian air force. For over a year prior to this there had been speculation that the group would separate from Al-Qaeda and about what it would mean. On 12 February 2015, SITE Intelligence Group cited rumours that Nusra leader al-Julani had plans to disassociate from al-Qaeda. On 4 March 2015, Reuters reported that "sources within and close to al-Nusra" said that in the past months Qatar and other Gulf states had talked with Nusra leader Abu Mohammad al-Julani and encouraged him to abandon al-Qaeda, promising funding to Nusra once that break-up was carried out. An official close to the Qatari government had confirmed to Reuters that Qatar wanted Nusra to become purely Syrian and disconnect from al-Qaeda, after which Qatar would start to support Nusra with money and supplies. Muzamjer al-Sham, reportedly a 'prominent jihadi close to Nusra' had said that Nusra would soon merge with Jaish al-Muhajireen wal-Ansar and other small jihadi brigades and disengage from al-Qaeda, but that not all Nusra emirs had yet agreed to that. On 9 March 2015, in a statement issued on Twitter, al-Nusra denied "completely all reports of a meeting with Qatari" and reports of a break-up with al-Qaeda. Expert Thomas Pierret at the University of Edinburgh assumed that Qatar was trying to force the hand of Al-Nusra with this "leak" about a split, and said a break with Al-Qaeda was very unlikely. French expert on jihadism Romain Caillet agreed: "The overwhelming majority of Al-Nusra members want to stay in al-Qaeda, particularly foreign fighters who represent at least one-third of the organisation". But in May 2015 Abu Maria al-Qahtani, the commander of al-Nusra in Deir ez-Zor province, still strongly advocated a split with al-Qaeda. Muhamed Nabih Osman, leading a charitable organisation for former Assad prisoners, said to website The Daily Beast on 4 May 2015: "I think it will happen soon. You have to understand that al-Nusra consists of two very different parts and that one part, mostly local fighters, are not interested in global jihad". On 7 May 2015, a Turkish official said that Turkey and Saudi Arabia were bolstering Ahrar al-Sham at Nusra's expense, hoping that al-Sham's rise puts pressure on Nusra to renounce its ties to al-Qaeda and open itself to outside help. A "well-connected Syrian Islamist" cited in May 2015 by Charles Lister in The Huffington Post said: "There are now two main currents... the conservatives are keen on keeping ties to Al-Qaeda and the others are more inclined towards the new Syria-focused approach". Another "Islamist official from Damascus" is cited: "Nusra's disengagement from al Qaeda would be good for the revolution, but Jabhat al-Nusra will always be in dire need of al Qaeda's name to keep its foreign fighters away from IS. Most Jabhat foreign fighters will never accept to fight and die for what looks like an Islamic national project." In late July 2016, through various sources, the Middle East Eye claimed that an organizational split from al-Qaeda is "imminent", with the proposal reportedly been approved by AQ leaders and proposed a new name called "Jabhat Fatah al-Sham", or the "Conquest of the Levant Front". However, the sources claimed that the move would not affect al-Nusra's al-Qaeda ideology and its plan to commit attacks on the West. The organisation grew in early 2016. Charles Lister reported that "According to three Islamist sources based in the area, Jabhat al-Nusra successfully recruited at least 3,000 Syrians into its ranks between February and June 2016." In mid-2016, reports suggested it was composed of around 5,000 to 10,000 fighters, with the Russian ministry of defence estimating 7,000 fighters in Idlib province. In August 2016, the BBC estimated Jabhat Fatah al-Sham as having 5,000–10,000 fighters, all Syrian. Lister gave a figure of 10,000. In July Jabhat Fatah al-Sham kidnapped the American journalist Lindsey Snell in northern Syria. She escaped to Turkey's Hatay Province in August and was subsequently arrested by Turkish authorities for being in a military exclusion zone and imprisoned. On 31 August, Hezbollah attacked a JFS outpost in the Qalamoun Mountains near the city of Arsal, Lebanon, on the Lebanon–Syria border, killing a number of their fighters. On 8 September an airstrike of unknown origin killed the top JFS military commander, Abu Hajer al-Homsi (nom de guerre Abu Omar Saraqeb), among several other Army of Conquest commanders in the countryside of the Aleppo Governorate, the rebels accused the United States of conducting the strike, but this was denied by the Pentagon and subsequently Russia took responsibility. On 3 October, Ahmad Salama Mabruk, an Egyptian JFS and al-Qaeda commander, was killed by a US airstrike against his vehicle in Jisr al-Shughur. On 9 October, Jund al-Aqsa, after infighting between them and numerous rebel groups including Ahrar al-Sham, merged with JFS. In early October, according to pro-government media, a number of Mountain Hawks Brigade fighters defected to join Jabhat Fatah al-Sham due to several disagreements, mainly due to the established of the Free Idlib Army. On 25 January 2017, they returned, along with their leader, Lt. Col. Nasha'at Haj Ahmad to the Mountain Hawks Brigade. As of late 2016, al-Nusra mainly controlled territory throughout Idlib Governorate, alongside other factions in the Army of Conquest. It also held some areas in the Quneitra Governorate. On 19 January 2017, US airstrikes by Boeing B-52 Stratofortress strategic bombers struck the former Syrian Army Sheikh Suleiman military base in western Aleppo, which was used by Jabhat Fatah al-Sham and the Nour al-Din al-Zenki Movement, killing at least 110 al-Qaeda fighters, including Abu Hasan al-Taftanaz, an al-Qaeda senior leader, along with some al-Zenki fighters. Since 1 January 2017, more than 150 AQ members were killed by US airstrikes in 2017. Condolences were issued to Jabhat Fatah al-Sham over the killings, by the Uyghur jihadist Turkistan Islamic Party. The training camp had been operated by al-Nusra Front and al-Zenki since 2013. Outrage over the lack of condolences from other factions over an American bombing and killing of 100+ JFS members was voiced by Muhaysini. On 21 January 2017, 5 factions from Ahrar al-Sham left to join the al-Nusra Front;- Jaish al-Ahrar, al-Bara, Dhu Nurayn, al-Sawa'iq and Usud al-Har Battalion. On the same day, 2 al-Nusra Shura Council members based in Aleppo announced that they left the group. Ahrar al-Sham, the Suqour al-Sham Brigade, Jabhat Ahl al-Sham, Jaysh al-Islam and Fastaqim Union then established a joint operations room to combat al-Nusra and its subfaction Jund al-Aqsa. Abu Umar Saraqib and Abu Faraj's deaths received condolences from the Turkistan Islamic Party. On 28 January 2017, several Salafist jihadist groups, including Jabhat Fatah al-Sham, agreed upon a merger agreement, resulting in the formation of a new group called Hay'at Tahrir al-Sham ("Organization for the Liberation of the Levant"). With Jabhat Fateh al-Sham being one of the most powerful/influential groups in the new formation, its leader Abu Mohammad al-Julani was appointed the high level position of overall military commander of the new group. The only other position of equal or greater authority in the new group is the Emir, to which role was appointed Abu Jaber, who defected from Ahrar al-Sham to join this new group. At least one Arab government accused Qatar of helping al-Nusra. In 2015, The Independent reported that Saudi Arabia and Turkey were "focusing their backing for the Syrian rebels on the combined Jaish al-Fatah, or the Army of Conquest, a command structure for jihadist groups in Syria that [included] Jabhat al-Nusra." Al-Nusra was also materially supported by multiple foreign fighters. Most of these fighters were from Europe and the Middle East, as pipelines to Syria from those locations are better established and navigable. However, as of November 2013, there were also 6 publicly disclosed cases of American citizens and permanent residents who joined or attempted to join al-Nusrah in 2013 alone. The US Government sent weapons to rebels in Syria from at least late 2013, and perhaps as early as 2012, during the beginning phases of the conflict (CIA's covert program Timber Sycamore). Some of these weapons reportedly fell into the hands of al-Nusra. Weapons have been passed on to Nusra by Ahrar ash-Sham according to a Nusra member and rebels. The Pentagon confirmed in September 2015 that a small group of US-trained New Syrian Forces rebels gave six pickup trucks and a portion of their ammunition to al-Nusra Front in exchange for safe passage. There were cases of al-Nusra combatants receiving medical aid in Israel and returning to fight. Former head of Mossad, Efraim Halevy, in an interview for al-Jazeera implicitly confirmed that such practices had taken place, as part of a general Israeli policy of treating wounded rebel fighters on the border. However, Israel denies formal ties of any sort between itself and al-Nusra  and Elizabeth Tsurkov reported that Nusra refused to cooperate with Israel, in fact kidnapping and assassinating suspected collaborators. The Emir of Qatar publicly admitted, in an interview with Christiane Amanpour, that he doesn't always see eye to eye with American terrorist designations: "I know that in America and some countries they look at some movements as terrorist movements. ... But there are differences. There are differences that some countries and some people that any group which comes from Islamic background are terrorists. And we don't accept that. It would be a "big mistake," to consider every Islamic movement to be "extremists." It has been suggested[by whom?] that one of the designated groups that the Emir spoke of in this interview at CNN was Al-Nusra Front. According to the Consortium Against Terror Finance (CATF), Qatar was able to get away with funding Al Nusra, despite their terrorist designation, through Kidnapping for Ransom. [verification needed] Al Nusra has kidnapped a diverse group of people from nationalities that span the globe, including . Turkey, Fiji, Lebanon, Syria and Italy. On each occasion, Qatar engaged in a substantial financial agreement with Al Nusra in exchange for hostages. CATF suggests that the U.S. turned a blind eye to Qatar's funding of Al Nusra because Al Nusra was one of the only groups posing a plausible threat to both ISIS and Assad. [verification needed] According to the one analyst, the reason why Al Nusra was the only plausible threat was because of Saudi and Qatari funding: "Jabhat al-Nusra has become the best-armed force among the opposition groups. It has been at the tip of the spear in operations in Eastern Syria, Aleppo, and Damascus. Its combat proficiency and relatively greater access to material and funding have led other opposition groups to tolerate its participation in military operations across the country." Qatar managed the negotiations mwith al-Nusra Front that ultimately led to American writer Peter Theo Curtis's release. Qatari Intelligence Chief Ghanim Khalifa al-Kubaisi sent a contact a text with the words "Done"—and a thumbs-up emoticon—after Curtis's release was completed. According to The Fiscal Times, Qatar had great influence over the group that goes beyond ransom payments. In many cases, Qatar acted as a political mediator between Al Nusra and other countries such as Lebanon: "A prisoner swap between the Lebanese government and al-Qaeda's branch in Syria, Al-Nusra Front in early December showed how powerful the group has become on the ground. The deal released 16 Lebanese soldiers and police officers who were captured during a joint ISIS–al-Nusra operation along with 29 civilians, some of whom are known terrorists." Indeed, Qatar's mediation between Al Nusra and Lebanon ultimately guaranteed al-Nusra freedom of movement inside what was once a safe haven in Lebanon's Hamid valley, bordering Syria, giving Al Nusra access to the Lebanese town of Arsal. But one diplomat went so far as to suggest that, beyond the scope of mediation and paying ransom, "They [Qatar] are partly responsible for Jabhat al-Nusra having money and weapons and everything they need." The diplomat went on to say that while Qatar hasn't directly funded ISIS, it is responsible for the fact that ISIS gained Al Nusra weapons as members of Al Nusra are known to defect to ISIS. Qatar's alleged support of Al Nusra was highly criticized in both U.S. and U.K media. As a result, Qatar had to suppress some of the more overt Al Nusra fund-raising efforts launched publicly by its citizens. An al-Nusra Front battalion training during the Syrian Civil War. The organisation is believed to have used, at various times and in various places, the following tactics: car-bombs, suicide-attacks, targeting of checkpoints, conventional assault of military bases, assassination of political and military figures and members of the shabiha, targeting (destruction/killing) of pro-government media stations and personnel. By June 2013, there had been apparently 70 suicide-attacks in Syria. Of these, the group denied responsibility for 13 but claimed responsibility for the other 57. In June 2012, the group attacked the pro-government TV station at Drousha, near Damascus. The following month the government-TV presenter Mohammed al-Saeed disappeared; the group later declared him dead. In June 2014, Human Rights Watch reported that several rebel groups, including al-Nusra, have enlisted child soldiers into their ranks. In November 2014, al-Nusra claimed to have captured U.S.-made TOW anti-tank missiles supplied by the United States to moderate anti-Assad rebels. The group allegedly captured tanks, machine guns, ammunition, vehicles and American anti-tank missiles from the U.S.-backed Syrian Rebel Front. Al-Nusra Front allegedly have an elite sniper unit known as the "Wolf Group". Training is conducted in Aleppo by veteran jihadists who belong to the Khorasan Group, a collection of veteran al-Qaeda operatives sent from al-Qaeda strongholds along the Afghan-Pakistan border. In October 2015, al-Julani called for indiscriminate attacks on Alawite villages in Syria. He said "There is no choice but to escalate the battle and to target Alawite towns and villages in Latakia". On 30 May, Turkish newspapers reported that Turkish security forces had arrested al-Nusra fighters in the southern provinces of Mersin and Adana near the Syrian border and confiscated 2 kg of sarin gas. [verification needed] The governor of Adana claimed that the security forces had not found sarin gas but unknown chemicals, without offering further elaboration. The Turkish Ambassador to Moscow later said that tests showed the chemical seized was anti-freeze, not sarin. In September six of those arrested in May were charged with attempting to acquire chemicals which could be used to produce sarin; the indictment said that it was "possible to produce sarin gas by combining the materials in proper conditions." The indictment said that "The suspects have pleaded not guilty saying that they had not been aware the materials they had tried to obtain could have been used to make sarin gas. Suspects have been consistently providing conflicting and incoherent facts on this matter." The indictment said the suspects working for al-Nusra and to Ahrar ash-Sham. On 29 May 2012, a mass execution was discovered near the eastern city of Deir ez-Zor. On 5 June 2012, the al-Nusra Front claimed responsibility for the killings. During the 2013 Latakia offensive by rebel Islamist groups including al-Nusra Front in early August, according to Human Rights Watch, Salafist rebel forces led by al-Nusra systematically killed at least 190 civilians in several Alawite villages. On 10 September 2013, al-Nusra fighters attacked the Alawite village of Maksar al-Hesan, in Homs province. Al-Nusra later admitted to the killing of 30 civilians overall in three Alawite villages, includes those in Maksar al-Hesan. On 11 December 2013, the rebel Islamic Front and al-Nusra Front groups infiltrated the industrial area of the town of Adra, northeast of Damascus, attacking buildings housing workers and their families. The rebels targeted Alawites, Druze, Christians and Shiites, killing them on a sectarian basis. Some people were shot while others were beheaded. On 10 June 2015, the al-Nusra killed at least 20 Druze villagers in Qalb Lawzeh in Idlib province. On 12 May 2016, according to pro-government media, rebels led by al-Nusra Front and Ahrar ash-Sham massacred 42 civilians and seven NDF militiamen while kidnapping up to 70 people after taking control of the Alawite village of Zara'a in Southern Hama. During the last days of the 17th Aleppo offensive in mid-December 2016, the al-Nusra Front arrested a media activist at a field hospital while he filmed the hospital operations. He was interrogated at al-Nusra's headquarters before the evacuation. During the evacuation of rebels from Aleppo, al-Nusra were the first to leave, along with prisoners whom they kidnapped. ^ a b c "Interview with Official of Jabhat al-Nusra, Syria's Islamist Militia Group". Time. 25 December 2012. Retrieved 29 November 2013. ^ "Syria Islamist factions, including former al Qaeda branch, join forces - statement". Thomson Reuters Foundation. 28 January 2017. Retrieved 1 February 2017. ^ Ghanmi, Elyès; Punzet, Agnieszka (11 June 2013). "The involvement of Salafism/Wahhabism in the support and supply of arms to rebel groups around the world" (PDF). European Parliament. ^ a b Hudson, Valerie. The Hillary Doctrine. Columbia University. p. 154. Retrieved 15 January 2016. ^ "Jabhat al-Nusra". Australian National Security. 28 June 2013. Retrieved 23 April 2015. ^ "Jabhat al-Nusra, A Strategic Briefing" (PDF). Quilliam Foundation. Archived from the original (PDF) on 28 March 2015. Retrieved 23 April 2015. ^ "Al-Nusra Front". 2012. Retrieved 24 May 2018. ^ "TIME Exclusive: Meet the Islamist Militants Fighting Alongside Syria's Rebels". Time. 26 July 2012. Retrieved 29 November 2012. ^ a b c "Air strike kills top commander of former Nusra group in Syria". Reuters. 9 September 2016. ^ Caleb Weiss (14 February 2017). "Uighur jihadist fought in Afghanistan, killed in Syria". Long War Journal. Retrieved 22 February 2017. ^ "Syria: ISIS tightens grip, Nusra takes losses". Al-Monitor. 2 May 2014. Retrieved 9 June 2015. ^ Abdallah Suleiman Ali (12 February 2014). "ISIS losing ground in Syria to Jabhat al-Nusra". Al-Monitor. Archived from the original on 22 February 2014. Retrieved 14 February 2014. ^ Nick Paton Walsh and Laura Smith-Spark (6 November 2014). "Report: Airstrikes target another Islamist group in Syria". CNN. Retrieved 24 May 2018. ^ "Syria's Qaeda leader killed in explosion". ARA News. Archived from the original on 8 March 2015. Retrieved 6 March 2015. ^ "An internal struggle: Al Qaeda's Syrian affiliate is grappling with its identity". Brookings Institution. 31 May 2015. Retrieved 1 June 2015. ^ "Al Nusra Front claims Lebanon suicide attack". Al Jazeera. 11 January 2015. Retrieved 12 January 2015. ^ "Syria crisis: Spooked by rebel gains, Jordan doubles down on Islamic State". Christian Science Monitor. 4 May 2015. Retrieved 4 May 2015. ^ "Why De Mistura's Needs To Step Down". OGN News. 7 October 2016. Archived from the original on 6 May 2017. Retrieved 26 September 2015. ^ a b "Rebels launch full-on assault of Idlib city". Syria Direct. Retrieved 25 March 2015. ^ Nawaf Obaid (15 August 2018). "Trump Will Regret Changing His Mind About Qatar". Foreign Policy. Retrieved 25 August 2018. ^ "Qatar 'maybe' supported al-Qaeda in Syria, says former PM". Middle East Eye. 30 October 2017. Retrieved 25 August 2018. ^ "Abu Bakr Shishani Now Fighting Alongside Ajnad al-Kavkaz In Latakia". 9 February 2016. ^ "Malhama Tactical, The Fanatics Tactical Guru! - The Firearm Blog". 12 December 2016. ^ "Malhama Tactical (@MalhamaT) - Twitter". ^ "Izat Savetheplanet on Twitter". Retrieved 24 November 2016. ^ a b "Former Guantanamo detainee killed while leading jihadist group in Syria". Long War Journal. 4 April 2014. Retrieved 21 May 2014. ^ Aymenn Jawad Al-Tamimi (11 May 2014). "Key Updates on Iraq's Sunni Insurgent Groups". Brown Moses Blog. Retrieved 24 May 2018. ^ Mortada, Radwan (19 May 2014). "Hezbollah fighters and the "jihadis" Mad, drugged, homicidal, and hungry". al-Akhbar English. Retrieved 9 June 2014. ^ "Jabhat al-Nusra launches war against IS in Qalamoun". CNN. 15 May 2015. Archived from the original on 14 May 2015. Retrieved 15 May 2015. ^ "Jabhat al-Nusra, IS clash in Daraa". 16 December 2014. Archived from the original on 26 January 2015. Retrieved 24 May 2018. ^ "Rebels fight ISIS-linked group near Israeli-occupied Golan". AFP. 28 April 2015. Retrieved 9 May 2015. ^ "Al-Qaeda defeats Syrian moderate rebels in Idlib". ARA News. 2 November 2014. Retrieved 12 November 2014. ^ "Jabhat al-Nusra looks for battlefield breakout". As-Safir. 29 March 2015. Archived from the original on 31 March 2015. Retrieved 29 March 2015. ^ a b R., Green (25 November 2013). "Al-Qaeda Upgrades Its Presence in Syria". Middle East Media Research Institute. Archived from the original on 1 February 2017. Retrieved 24 August 2015. ^ a b c d e f g h i "Jabhat al-Nusra A Strategic Briefing" (PDF). Quilliam Foundation. 8 January 2013. Archived from the original (PDF) on 22 July 2014. Retrieved 22 August 2014. ^ a b c d Ignatius, David (30 November 2012). "Al-Qaeda affiliate playing larger role in Syria rebellion". The Washington Post. Archived from the original on 9 June 2018. Retrieved 28 August 2015. ^ "Terrorist Designations of the al-Nusrah Front as an Alias for al-Qa'ida in Iraq". U.S. Department of State. Archived from the original on 4 February 2017. Retrieved 8 June 2018. ^ a b "Zawahiri disbands main Qaeda faction in Syria". Agence France-Presse. 8 November 2013. Archived from the original on 9 November 2013. ^ Hubbard, Ben (1 October 2015). "A Look at the Army of Conquest, a Prominent Rebel Alliance in Syria". New York Times. Archived from the original on 4 October 2015. Retrieved 9 June 2018. ^ a b "Syrian Nusra Front announces split from al-Qaeda". BBC News. 28 July 2016. Archived from the original on 30 July 2016. Retrieved 28 July 2016. ^ Joscelyn, Thomas (28 January 2017). "Al Qaeda and allies announce 'new entity' in Syria". FDD’s Long War Journal. Archived from the original on 28 January 2017. Retrieved 9 June 2018. ^ Charles Lister (24 July 2016). "Profiling Jabhat al-Nusra" (PDF). The Brookings Project on U.S. Relations with the Islamic World. ^ "New enemies across Syrian border". August 2014. Retrieved 24 May 2018. ^ "The Syrian rebel groups pulling in foreign fighters". 2013. Retrieved 24 May 2018. ^ al-Khatieb, Mohammed (July 2014). "Jabhat al-Nusra, IS compete for foreign fighters". Al-Monitor. Archived from the original on 19 October 2017. Retrieved 24 May 2018. ^ "Al-Nusra Front not yet dead as its emir devises "Islamic Emirate of the Levant"". al-akhbar. July 2014. Archived from the original on 22 July 2014. Retrieved 24 May 2018. ^ a b c d e Sherlock, Ruth (2 December 2012). "Inside Jabhat al Nusra - the most extreme wing of Syria's struggle". The Daily Telegraph. London. Retrieved 2 December 2012. ^ a b "Profile: Syria's al-Nusra Front". BBC News. 15 May 2012. Retrieved 31 July 2012. ^ a b "Nusra leader: No end to conflict with ISIL in Syria". Al Jazeera. 4 June 2015. Retrieved 5 June 2015. ^ Hassan Hassan (4 March 2014). "A jihadist blueprint for hearts and minds is gaining traction in Syria". The National. ^ Hubbard, Ben (9 June 2015). "Al Qaeda Tries a New Tactic to Keep Power: Sharing It". The New York Times. Retrieved 10 June 2015. Cooperating with others could also give Al Qaeda a long-term advantage in its competition with the extremists of the Islamic State, analysts said [...] Civilians living in Nusra Front areas, too, say the group has built local support, refraining from imposing Shariah when residents resisted. ^ a b c d e Lister , Charles (31 May 2015). "An Internal Struggle: Al Qaeda's Syrian Affiliate Is Grappling With Its Identity". Huffington Post. Retrieved 27 August 2015. ^ Joscelyn, Thomas (25 October 2015). "Al Qaeda appears 'moderate' compared to Islamic State, veteran jihadist says". Long War Journal. ^ Joscelyn, Thomas (26 October 2015). "A rare interview with an experienced Al Qaeda commander shows how the group is using ISIS to make itself look 'moderate'". Business Insider. ^ Joscelyn, Thomas (5 June 2015). "The Al Nusrah Front's 'inherited jihad'". Long War Journal. ^ Joscelyn, Thomas (20 July 2015). "Officials from Al Nusrah Front, Ahrar al Sham vow to continue fight against Islamic State". Long War Journal. ^ JOSCELYN, THOMAS (9 February 2015). "Al Qaeda Uses ISIS to Try to Present Itself as Respectable, Even Moderate". the weekly Standard. ^ "Number of ISIS defectors growing, disillusioned with killing fellow Muslims: Study". The Straits Times. London. Agence France-Presse. 21 September 2015. Archived from the original on 25 September 2015. ^ Joscelyn, Thomas (29 June 2015). "Al Nusrah Front celebrates 9/11 attacks in new video". Long War Journal. ^ Joscelyn, Thomas (2 November 2015). "Al Qaeda chief calls for jihadist unity to 'liberate Jerusalem'". Long War Journal. ^ Joscelyn, Thomas (13 September 2015). "Zawahiri calls for jihadist unity, encourages attacks in West". Long War Journal. ^ "Syria's Nusra Front backs Paris attacks, despite opposition to Islamic State". Middle East Eye. Retrieved 28 November 2015. ^ "Syria and Islamist groups guilty of war crimes, YPG cleared: UN report". Kom News. 15 March 2017. Archived from the original on 17 March 2017. Retrieved 16 March 2017. ^ Chivers, C. J. (5 September 2013). "Brutality of Syrian Rebels Posing Dilemma in West". The New York Times. Retrieved 5 September 2013. ^ "Al Nusra's Rebranding and What It Means for Syria". Foreign Affairs. ^ yalibnan. "Al Qaeda forces Druze of Idlib Syria to destroy their shrines and convert". yalibnan.com. ^ Aymenn Jawad Al-Tamimi. "Additional Notes on the Druze of Jabal al-Summaq". Aymenn Jawad Al-Tamimi. ^ "Syria Comment » Archives The Plight of Syria's Druze Minority and U.S. Options - Syria Comment". Syria Comment. ^ "Elusive Al-Qaeda leader in Syria stays in shadows". The Times of Israel. Retrieved 13 January 2017. ^ "Al-Qaeda leader in Syria speaks to Al Jazeera". Al Jazeera. 19 December 2013. Retrieved 2 August 2014. ^ a b c "Who's who in the Nusra Front?". al-Araby. 15 December 2014. Retrieved 2 June 2015. ^ "The Formation of Hay'at Tahrir al-Sham and Wider Tensions in the Syrian Insurgency". Combating Terrorism Center at West Point. ^ a b "California Arrest Underscores Ongoing Concern Over Americans Joining Al Qaeda Abroad". Access ADL. Anti-Defamation League. ^ "North Carolina Arrest Marks 6th American in 2013 Associated With Al Qaeda in Syria". Access ADL. Anti-Defamation League. ^ Robert Patrick (9 April 2017). "funding case hope to prove St. Louis man was 'lawful combatant'". St Louis Post-Dispatch. Retrieved 1 October 2017. Seamus Hughes, deputy director of George Washington University's Program on Extremism, has researched Pazara's activities and called the defense motion "a very novel but uphill battle." ^ "Everything You Need To Know About the New Nusra Front". Time. 28 July 2016. ^ "Terrormonitor on Twitter: #SYRIA #Uzbek Faction Katibat at-Tawhid wal-Jihad Joins #AlQaeda Wing #Alnusra Front, Warns Against #US & #Russia". Twitter. 30 September 2015. Retrieved 24 May 2018. ^ "Terrormonitor on Twitter: #SYRIA #AlQaeda Wing #Uzbek Katibat Imam al Bukhari Released Video Shows Its #Jihadi Children Training In #Aleppo". Twitter. 29 December 2015. Retrieved 24 May 2018. ^ Roggio, Bill; Weiss, Caleb (29 December 2015). "Uzbek group in Syria trains children for jihad". Long War Journal. Foundation for Defense of Democracies. ^ "Terrormonitor on Twitter: #SYRIA #Uzbek Rebel Group Katibat Imam Bukhari Release Suicide Bomber Video, Who Detonating A #BMP In al-Fou'a". Twitter. 21 September 2015. ^ "Terrormonitor on Twitter: #SYRIA #Uzbek Wing Of Katibat Imam al-Bukhari Militants Before Attack Against Army On al-Fou'a & Kafraya In #Idlib". Twitter. 30 August 2015. Retrieved 24 May 2018. ^ Weiss, Caleb (30 April 2015). "Turkistan Islamic Party had significant role in recent Idlib offensive". Long War Journal. Foundation for Defense of Democracies. ^ a b Karouny, Mariam (4 March 2015). "Insight - Syria's Nusra Front may leave Qaeda to form new entity". Reuters. Retrieved 30 August 2015. ^ a b c "Qaeda in Syria denies plan to break away". Yahoo! News. AFP. 9 March 2015. Retrieved 30 August 2015. ^ a b c Dettmer, Jamie (4 May 2015). "SYRIA'S REBELS ON WINNING STREAK—IN ALLIANCE WITH AL QAEDA". The Daily Beast. Retrieved 4 May 2015. "I think it will happen soon," says Muhamed Nabih Osman, who oversees a charitable association for former Assad prisoners. "You have to understand that al Nusra consists of two very different parts and that one part, mostly local fighters, are not interested in global jihad." [...] But local fighters—who likely make up 80 percent of al Nusra—have been opposed to deal-making with ISIS and have been critical of the harsh governance methods used by some of their pro-ISIS comrades in territory controlled by al Nusra. ^ a b "Egyptian al Qaeda leader killed by US drone strike in Idlib, Syria". Business Insider. Retrieved 13 January 2017. ^ "Analysis: Al Nusrah Front rebrands itself as Jabhat Fath Al Sham". The Long War Journal. 28 July 2016. Retrieved 29 July 2016. ^ "Syrian branch of Al Qaeda rebrands in effort to escape foreign air strikes". ABC News. 29 July 2016. ^ a b c d Nashashibi, Sharif (7 August 2016). "The ramifications of the Nusra's split from al-Qaeda". Al Jazeera. Retrieved 10 December 2016. ^ a b Wright, Robin (12 December 2016). "AFTER THE ISLAMIC STATE". The New Yorker. Retrieved 9 December 2016. ^ Karouny, Mariam (26 September 2014). "Insight - U.S.-led strikes pressure al Qaeda's Syria group to join with Islamic State". Reuters. Retrieved 19 October 2014. ^ "Nusra leader: Our mission is to defeat Syrian regime". Al Jazeera. 28 May 2015. Retrieved 6 June 2015. ^ a b c d e f g Abouzeid, Rania (23 June 2014). "The Jihad Next Door". Politico. Retrieved 3 September 2018. ^ "Jihadists, weapons 'moving from Iraq to Syria'". Agence France-Presse. 11 February 2012. Retrieved 3 June 2015. ^ Karam, Zeina (6 July 2012). "Iraq: Al-Qaeda migrates to Syria". Associated Press. ^ a b c "With wary eye, Syrian rebels welcome Islamists into their ranks". The Times of Israel. 25 October 2012. Retrieved 28 November 2012. ^ a b "Syria Conflict: Rebels, Army Battle Over Taftanaz Airbase". The Huffington Post. 3 November 2012. Archived from the original on 5 November 2012. Retrieved 7 May 2013. ^ a b "U.S. Places Militant Syrian Rebel Group on List of Terrorist Organizations". New York Times. 10 December 2012. Retrieved 4 March 2015. ^ Bill Roggio (4 August 2012). "Al Nusrah Front conducts joint operation with Free Syrian Army". Longwarjournal.org. Retrieved 3 June 2015. ^ "Syria revolt attracts motley foreign jihadi corps". Agence France-Presse. 18 August 2012. Retrieved 3 June 2015. ^ "Islamist groups gaining prominence in Syria fight". USA Today. 14 December 2012. Retrieved 14 December 2012. ^ "Syrian rebels defy US and pledge allegiance to jihadi group". The Telegraph. London. 10 December 2012. Retrieved 14 December 2012. ^ "Syrian protesters slam U.S. blacklisting of jihadist group". Daily Star. Agence France-Presse. 14 December 2012. Retrieved 26 August 2015. ^ "For newly recognized Syrian rebel coalition, a first dispute with US". The Christian Science Monitor. 12 December 2012. Retrieved 26 August 2015. ^ ‘Islamist group post video claiming Syria attacks’. NOW., 29 February 2012. Retrieved 27 August 2015. ^ "Unknown Islamist group claims suicide attacks in Syria". Al Arabiya. 29 February 2012. Archived from the original on 30 March 2012. Retrieved 25 March 2012. ^ a b Bill Roggio (26 February 2012). "Al Nusrah Front claims suicide attack in Syria". The Long War Journal. Retrieved 25 March 2012. ^ "Islamist group claims Syria bombs 'to avenge Sunnis'". Al Arabiya. 21 March 2012. Archived from the original on 23 March 2012. Retrieved 23 March 2012. ^ "Jihadist group denies claiming Damascus bombings". Dawn. Agence France-Presse. 15 May 2012. Archived from the original on 19 July 2012. Retrieved 7 May 2013. ^ Gladstone, Rick (30 May 2012). "U.S. Envoy Sees Grim Outcome for Syria". The New York Times. Retrieved 11 June 2013. ^ "Militant group claims killing of 13 in Syria". Reuters. 5 June 2012. Retrieved 11 June 2012. ^ "Terrorist Al-Ayesh, Who Supervised Rigging Car Bombs Detonated in Damascus, Killed". Archived from the original on 31 October 2012. Retrieved 24 October 2014. ^ "Seven killed in attack on Syrian TV station". Mail & Guardian. 27 June 2012. Retrieved 7 May 2013. ^ "Jihadists claim Syria attacks". Associated Press. 4 July 2012. Archived from the original on 8 November 2013. Retrieved 15 November 2013. ^ "Syrian TV presenter executed - Doha Freedom Centre". dc4mf.org. 5 August 2012. Retrieved 27 August 2015. ^ "Syrian TV presenter Mohammad al Saeed has been executed by Islamist armed group Al-Nusra, says rights group". Al Jazeera. 4 August 2012. Retrieved 7 May 2013. ^ "Militant group Al-Nusra claim suicide bombings in Aleppo". Reuters. 4 October 2012. Retrieved 8 October 2012. ^ "Militant group Al-Nusra claim suicide bombings in Aleppo". Reuters. 4 October 2012. Retrieved 3 June 2015. ^ "Sada el-Balad". El-balad.com. 3 October 2012. Retrieved 7 May 2013. ^ "ABC News:Dozens killed in Aleppo bomb blasts". Australian Broadcasting Corporation. 3 October 2012. Retrieved 7 May 2013. ^ "Militant group says was behind Aleppo air defense base assault". Reuters. 20 October 2012. Retrieved 7 May 2013. ^ "Syria, most rebels agree to four-day truce". Afr.com. 25 October 2012. Retrieved 7 May 2013. ^ "Syrian rebels kill 28 soldiers as fighting continues". The Jordan Times. 1 November 2012. Archived from the original on 28 November 2012. Retrieved 7 May 2013. ^ Matthew Weaver (2 November 2012). "Syria conflict: rebel 'war crime' caught on video". The Guardian. London. Retrieved 7 May 2013. ^ "At least 50 pro-Assad forces killed in Syria suicide bombing, activists say". Haaretz. 5 November 2012. Retrieved 5 November 2012. ^ Karouny, Mariam (5 November 2012). "Suicide bomber kills 50 Syrian security men: opposition". Reuters. Retrieved 7 May 2013. ^ "Syria 'secures chemical weapons stockpile'". Al Jazeera. 23 December 2012. Retrieved 29 December 2012. ^ "Syrian rebels push offensive for major airport". Ynet. 18 February 2013. Retrieved 11 June 2013. ^ "Priest Beheaded on Video By Syrian Jihadists Bears 'No Relation' To Death of Father François Murad [CORRECTION]". International Business Times. 2 July 2013. Retrieved 21 January 2014. ^ "Suicide bombers kill 14 in Damascus". Retrieved 3 June 2015. ^ Barnard, Anne; Saad, Hwaida (9 March 2014). "Nuns Released by Syrians After Three-Month Ordeal". The New York Times. ^ "Free Syrian Army rebels defect to Islamist group Jabhat al-Nusra". The Guardian. London. 8 May 2013. ^ "Qaeda in Iraq confirms Syria's Nusra is part of network". Agence France-Presse. 9 April 2013. Archived from the original on 13 May 2013. Retrieved 9 April 2013. ^ a b "ISI Confirms That Jabhat Al-Nusra Is Its Extension In Syria, Declares 'Islamic State Of Iraq And Al-Sham' As New Name of Merged Group". MEMRI. 8 April 2013. Archived from the original on 6 October 2014. Retrieved 10 April 2013. ^ "Al-Nusra Commits to al-Qaeda, Deny Iraq Branch 'Merger'". Agence France-Presse. 10 April 2013. Retrieved 18 May 2013. ^ Spencer, Richard (19 May 2013). "Syria: Jabhat al-Nusra split after leader's pledge of support for al-Qaeda". The Telegraph. London. Retrieved 21 May 2013. ^ a b "Iraqi al-Qaeda chief rejects Zawahiri orders". Al Jazeera. 15 June 2013. Retrieved 15 June 2013. ^ "Insight: Syria's Nusra Front eclipsed by Iraq-based al Qaeda". Reuters. 17 May 2013. Retrieved 18 May 2013. ^ "PressTV-Al-Nusra leader injured in Syria: report". presstv.com. Archived from the original on 2 April 2015. ^ "Qaeda chief annuls Syrian-Iraqi jihad merger". Al Jazeera. 9 June 2013. Retrieved 10 June 2013. ^ "Factbox: Syria's rebel groups". Reuters. 9 January 2014. Retrieved 9 January 2014. ^ Liz Sly (3 February 2014). "Al-Qaeda disavows any ties with radical Islamist ISIS group in Syria, Iraq". The Washington Post. Retrieved 27 August 2015. ^ "Syria: al-Nusra Front declares war on ISIS". Al Akhbar English. 26 February 2014. Retrieved 18 August 2014. ^ "Al-Nusra chief killed by rivals in Syria". 16 April 2014. Retrieved 3 June 2015. ^ "Hundreds killed as ISIL insurgents gain ground in east Syria". Reuters. 10 June 2014. Retrieved 12 July 2014. ^ "Al Qaeda leaves east Syria strongholds to Islamic State -monitor". Retrieved 24 October 2014. ^ "Al Qaeda's rise in southern Syrian pushes moderate rebels to sideline". Retrieved 24 October 2014. ^ "Will the 'Emirate of the Levant' be announced on Eid al-Fitr?". Retrieved 24 October 2014. ^ "Jabhat al-Nusra, IS compete for foreign fighters". Al-Monitor. Archived from the original on 19 October 2017. Retrieved 24 October 2014. ^ "Rebels Call on Al Nusra Front to Rethink Establishing its "Emirat". Syrian National Coalition of Syrian Revolution and Opposition Forces. Retrieved 24 October 2014. ^ "UN official defends Indian general in Syrian peacekeeping controversy". Zee News. IANS. 4 September 2014. Retrieved 13 September 2014. ^ "UN soldiers seized by rebels in Golan Heights". Al Jazeera. Retrieved 13 September 2014. ^ "UN soldiers escape siege by Syria rebels". Al Jazeera. 31 August 2014. Retrieved 13 September 2014. ^ "Irish troops evacuate Filipino peacekeepers in Syria". The Irish Times. 30 August 2014. Retrieved 13 September 2014. ^ "UN official defends Indian general in Syrian peacekeeping controversy". 4 September 2014. Retrieved 13 September 2014. ^ "Duterte: Shoot Undof chief in the head". Inquirer. Retrieved 13 September 2014. ^ "Syria conflict: Rebels release Fijian UN peacekeepers". BBC News. Retrieved 13 September 2014. ^ "Islamic State, rival Al Nusra Front each strengthen grip on Syria". Los Angeles Times. 28 November 2014. Retrieved 6 December 2014. ^ "U.S.-backed Syria rebels routed by fighters linked to al-Qaeda". The Washington Post. 1 November 2014. Retrieved 8 December 2014. ^ "Syrian civil war: Jabhat al-Nusra's massacre of Druze villagers shows they're just as nasty as Isis". Independent. Retrieved 7 July 2015. ^ "For Syria's Druze, survival hinges on choosing the right ally". Al Jazeera. Retrieved 7 July 2015. ^ "Jenan Moussa on Twitter". Twitter. ^ "LiveLeak.com - Jabhat Al-Nusra Behead Two Jesh Al-Thowar Syrian Rebels". liveleak.com. ^ "LiveLeak.com - *Graphic 18+* Jabhat al-Nusra Behead Captured Moderate Rebel". liveleak.com. ^ "الجزيرة مباشر on Twitter". Twitter. ^ a b "Why Assad is losing". Foreign Policy. 5 May 2015. Retrieved 31 August 2015. ^ "إذاعة النور - الأخبار - "أحرار الشام" تطرد مسلحي "النصرة" من "حارم" واشتباكات بينهما في مدينة سلقين - إذاعة النور". www.alnour.com.lb. Archived from the original on 30 January 2016. Retrieved 25 January 2016. ^ "Jund al Aqsa leaders join Al Nusrah Front". The Long War Journal. Retrieved 9 April 2016. ^ "2 Damascus-based jihadist groups swear allegiance to Al Nusrah Front". The Long War Journal. 22 February 2016. Retrieved 9 April 2016. ^ khaled. "جبهة النصرة تخلي مقارها في سرمدا الحدودية مع تركيا منعاً لاستخدامها كذريعة لقصف البلدة". المرصد السورى لحقوق الإنسان. ^ Sheikh Zahran Alloush about Hajj 2013 & Usama bin Laden. Youtube. 4 May 2015. Retrieved 19 August 2015. ^ Sheikh Zahran Alloush about Hajj 2013 & Usama bin Laden - Video Dailymotion. Dailymotion. Retrieved 25 December 2015. ^ Islam Army Sheikh Zahran Alloush -- Jabhat al-Nusra are our Brothers. YouTube. 6 April 2015. Retrieved 19 August 2015. ^ a b "Russia calls on all states to put Islamic State, Jabhat al-Nusra on terrorist lists". Russian News Agency "TASS". Retrieved 29 December 2014. ^ "Russia launches media offensive on Syria bombing". BBC News. 1 October 2015. ^ "Syria's Russian Jihadists Vow To Slaughter Putin's Invading Army". vocativ.com. ^ "Russian Embassy shelled in Syria as insurgents hit back". Yahoo News. 13 October 2015. Archived from the original on 19 October 2015. Retrieved 14 October 2015. ^ a b "Syria's Nusra Front leader urges wider attacks on Assad's Alawite areas to avenge Russian bombing". The Daily Telegraph. 13 October 2015. ^ "Head of al Qaeda's Syrian branch threatens Russia in audio message". The Long War Journal. Retrieved 16 October 2015. ^ "After shooting down Russian jet, what's next for Turkey?". Al-Monitor. 26 November 2015. Archived from the original on 31 December 2015. Retrieved 5 December 2015. ^ "Al-Nusra leader Jolani announces split from al-Qaeda". al Jazeera. 29 July 2016. Retrieved 10 December 2016. ^ a b "Analysis: Al Nusrah Front rebrands itself as Jabhat Fath Al Sham". FDD's Long War Journal. Retrieved 13 January 2017. ^ "US drone strike kills prominent Turkish al-Qaeda leader". ARA News. 3 November 2016. Retrieved 13 January 2017. ^ "Al Nusra Front Has 'Dissociated' from Al Qaeda, Says Abu Muhammad al Julani". International Business Times. 12 February 2015. Retrieved 27 August 2015. ^ Butler, Desmond (7 May 2015). "Turkey Officials Confirm Pact With Saudi Arabia To Help Rebels Fighting Syria's Assad". Huffington Post. AP. Archived from the original on 8 May 2015. Retrieved 27 August 2015. Turkish officials say they distinguish between international jihadist groups and others with more localized aims. They place al-Sham in the latter category. Moreover, they hope to use al-Sham's rise to put pressure on Nusra to renounce its ties to al-Qaida and open itself to outside help. ^ "Nusra Front split from al-Qaeda 'imminent', sources claim". Middle East Eye. 25 July 2016. ^ "US journalist who escaped Jabhat Fateh Al-Sham captivity, lands in Turkey jail for violating military zone". International Business Times. 1 September 2016. ^ OGN – Tahreer Sham: Who won in this merger?. OGN TV. 29 January 2017. ^ "Hezbollah kills Jabhat Fateh al Sham militants on Lebanese border". Al-Bawaba. 1 September 2016. ^ "Statement by Pentagon Press Secretary Peter Cook on Strike against al-Qaida Leader". US Department of Defense. 3 October 2016. ^ "جيش إدلب الحر (@free_idleb_army) – Twitter". ^ "Syria rebels capture key Idlib army bases". Al Jazeera English. 15 December 2014. Retrieved 31 August 2015. ^ "Syria conflict: Rebels seize key Idlib airbase". BBC News. Retrieved 19 September 2015. ^ "Monitors: Airstrike in Syria Kills Extremist Leaders Near Turkish Border". VOA News. 2 January 2017. ^ Orton, Kyle (20 January 2017). "The Coalition Strikes Down Al-Qaeda's Leaders In Syria". The Syrian Intifada. ^ "Ex-Qaeda affiliate leaders among 25 dead in Syria strike". AFP. 4 January 2017. ^ Weiss, Caleb (14 February 2017). "Uighur jihadist fought in Afghanistan, killed in Syria". Long War Journal. Foundation for Defense of Democracies. ^ "Two days after the killing of "jihadist" leaders… airstrikes by unknown warplanes again near Sarmada". Syrian Observatory for Human Rights. 3 January 2017. ^ "Up To 120 Al-Nusra (Al-Qaeda) Members And Their Allies Killed In US Airstrike In Idlib". 20 January 2017. ^ a b "US air strikes kill more than 100 'al-Qaeda militants' at training camp in Syria". ^ "Al Maqalaat Pubs on Twitter". ^ "Aymenn J Al-Tamimi on Twitter". ^ "2 JFS Shura members (1 is in charge of economy + other is Aleppo military commander) announced they have left the group • /r/syriancivilwar". ^ "Ahrar Al Sham, Jaish Al Mujahideen, Suqour Sham, Fastaqum, Jaish Islam establish joint operation room to fight Jund Aqsa/JFS • /r/syriancivilwar". ^ "Suqor al-Sham leader @aleesa71 blames JFS for protecting "ISIS" (Jund al-Aqsa) & makes clear the near to "eradicate" the threat in Idlib • /r/syriancivilwar". ^ "New statement from Ḥizb al-Islāmī al-Turkistānī in Bilād al-Shām: "Condolences on the Martyrdom of the Constellation of Heroes"". Jihadology. 22 January 2017. ^ a b "Al Qaeda and allies announce 'new entity' in Syria | FDD's Long War Journal". FDD's Long War Journal. Retrieved 29 January 2017. ^ "الاعلام الحربي مركزي on Twitter". Twitter. Retrieved 29 January 2017. ^ David Blair and Richard Spencer (20 September 2014). "How Qatar is funding the rise of Islamist extremists". Telegraph. Retrieved 28 November 2015. ^ "Gulf crisis seen widening split in Syria rebellion". Reuters. ^ "American and International Militants Drawn to Syria". Anti-Defamation League. ^ "North Carolina Arrest Marks 6th American in 2013 Associated With Al Qaeda in Syria". Access ADL. Anti-Defamation League. Retrieved 13 November 2013. ^ Ernesto Londoño and Greg Miller (11 September 2013). "CIA begins weapons delivery to Syrian rebels - The Washington Post". The Washington Post. Retrieved 18 August 2014. ^ Lisa Lundquist (27 April 2014). "The shadowy flow of US weapons into Syria". Longwarjournal.org. Retrieved 3 June 2015. ^ Karouny, Mariam (22 September 2015). "Resilient insurgent group Ahrar al-Sham to play bigger role in Syria". Reuters. BEIRUT. ^ "US-trained Syria fighters gave equipment to Nusra Front". Al Jazeera. Retrieved 28 November 2015. ^ "Report: Israel treating al-Qaida fighters wounded in Syria civil war". Jerusalem Post. 15 March 2015. Retrieved 10 August 2016. ^ "Ex-Mossad head on Israel medical aid to al-Nusra Front". Al-Jazeera. 31 May 2016. Retrieved 10 August 2016. ^ "IDF denies ties between Israel, Jabhat al-Nusra". Al Monitor. 24 June 2015. Retrieved 19 February 2018. ^ Krever, Mick (25 September 2014). "Qatar's Emir: We don't fund terrorists". CNN.com. Retrieved 28 July 2016. ^ Kimberly Kagan. "The Smart and Right Thing in Syria". Hoover Institute. Retrieved 20 December 2018. ^ "The Case Against Qatar". Foreign Policy. 30 September 2014. Retrieved 28 July 2016. ^ a b c "How Qatar Is Funding al-Qaeda-and Why That Could Help the U.S." The Fiscal Times. 29 December 2015. Retrieved 28 July 2016. ^ Blair, David (20 September 2014). "How Qatar is funding the rise of Islamist extremists". Telegraph. Retrieved 28 July 2016. ^ "Qatar's Support of Islamists Alienates Allies Near and Far". The New York Times. 8 September 2014. ^ Deborah E. Bloom. "Syria rebel groups recruit child soldiers, says rights watchdog". CNN. Retrieved 27 June 2014. ^ "Syria: Al-Nusra Jihadists 'Capture US TOW Anti-Tank Missiles' from Moderate Rebels". International Business Times. 3 November 2014. ^ "MAPPING MILITANT ORGANIZATIONS: Hay'at Tahrir al-Sham (Formerly Jabhat al-Nusra)". Stanford University. 14 August 2017. ^ Paraszczuk, Joanna (2 October 2014). "Wolf or Khorasan: Who Was Jabhat al-Nusra's Abu Yusuf al-Turki?". Chechens in Syria. Retrieved 10 October 2014. ^ a b McDonnell, Patrick J. (13 September 2013). "Syrian rebel groups sought sarin gas material, Turkish prosecutors say". Los Angeles Times. Retrieved 22 November 2013. ^ "Report: Police foil al-Nusra bomb attack planned for Adana". Today's Zaman. 30 May 2013. Retrieved 19 June 2013. ^ Burch, Jonathon (30 May 2013). "Turkey arrests 12 in raids on 'terrorist' organization". Reuters. Retrieved 8 August 2013. ^ Gladstone, Rick (30 May 2012). "U.S. Envoy Sees Grim Outcome for Syria". New York Times. ^ "Militant group claims killing of 13 in Syria". Reuters. Retrieved 27 October 2014. ^ ""You Can Still See Their Blood" - Executions, Unlawful Killings, and Hostage Taking by Opposition Forces in Latakia Countryside". Human Rights Watch. 11 October 2013. ^ "Syria Massacre? Nusra Front Fighters Reportedly Kill Women, Children, Elderly Men In Alawite Village". The Huffington Post. 12 September 2013. Retrieved 27 October 2014. ^ "Syria jihadists claim they killed Homs Alawites". Retrieved 27 October 2014. ^ "Islamists kill 15 Alawite and Druze civilians in Syria -activists". Retrieved 27 October 2014. ^ "Syrian troops launch offensive after dozens killed". Retrieved 27 October 2014. ^ "Activists: Al Qaeda affiliate kills 20 members of minority sect in Syria". Fox News. Archived from the original on 14 June 2015. Retrieved 29 June 2015. ^ Leith Fadel (12 May 2016). "Syrian opposition forces massacre, kidnap 120 civilians in southern Hama". Al Masdar News. Retrieved 12 May 2016. ^ "Islamists agree to hand over corpses of civilians massacred in northern Homs". Al-Masdar News. 24 May 2016. Retrieved 1 June 2016. ^ "The Jabhat Fath Al-Sham were among the first to leave besieged Aleppo and the fate of those they arrested remains unknown". Aleppo 24. 17 December 2016. ^ "Jabhat al-Nusra | Australian National Security". Nationalsecurity.gov.au. Retrieved 18 August 2014. ^ "UN blacklists Syria's al-Nusra Front". Al Jazeera. 31 May 2013. Retrieved 2 September 2015. ^ a b "Turkey lists al-Nusra Front as terrorist organization". Hürriyet Daily News. 3 June 2014. Retrieved 3 September 2015. ^ ‘Liste unique de gels’. République Française, Trésor Direction Générale, Sanctions financières internationales. Published 28 August 2015. Retrieved 3 September 2015. (Click on 'liste consolidée de gel d'avoirs'; then click on 'liste unique':) "Nr. 314: Al-Nusrah Front. [translated:] Designated by the regulation (European Union) nr. 583/2014 of 28 May 2014. Previously, Al-Nusrah was inscribed on the list, between 30 May 2013 and 13 May 2014, in its quality of alias of Al-Qaida in Iraq. Category: terrorism. Rule: Resolution 1989." ^ "Australian Government lists anti-Assad Syrian group as terrorist organisation - ABC News (Australian Broadcasting Corporation)". Australian Broadcasting Corporation. 29 June 2013. Retrieved 15 November 2013. ^ "Britain bans Syria's al-Qaida-linked Nusra Front on terrorism grounds". Fox News Channel. 19 July 2013. Retrieved 15 November 2013. ^ "'Public Safety Canada. Currently listed entities.'". Publicsafety.gc.ca. 20 November 2014. Retrieved 3 September 2015. ^ "Saudi Arabia lists terrorist groups - Xinhua | English.news.cn". Xinhua News Agency. 8 March 2014. Retrieved 18 August 2014. ^ (List of) "Designated individuals and organisations" in New Zealand as "terrorist entities". police.govt.nz, (presumably) 26 Nov. 2014. Retrieved 2 September 2015. See page 135: "associated with Al-Qaeda"; page 151: Al-Nusrah Front, "Listed on 14/5/2014". ^ "UAE to try nine for recruiting militants to fight in Syria: agency". Reuters. 19 May 2014. Retrieved 18 August 2014. ^ Dorian Jones (4 June 2014). "Turkey Designates Al-Nusra Front as a Terrorist Organization". Voice of America. Retrieved 18 August 2014. ^ "Russia seeks UN ban on oil trade with terrorists in Syria". En.alalam.ir. 2 July 2014. Retrieved 18 August 2014. ^ "UN threatens sanctions on anyone trading oil with ISIS terrorists – RT News". Russia: RT. 29 July 2014. Retrieved 18 August 2014.